Correlations," ''American Control Conference'', Albuquerque, NM, IEEE Publications, Piscataway, NJ, June 1997, pp. 2369 - 2373. 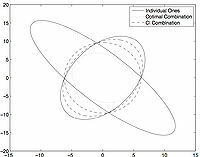 Julier, S. J., and Uhlmann, J., K., General Decentralized Data Fusion with Covariance Intersection (CI) in ''Handbook of Multisensor Data Fusion''. CRC Press. Boca Raton, FL., 2001, Chap. 12. Shuster, M. D., "A Survey of Attitude Representations," ''Journal of the Astronautical Sciences,''Vol. 41, No. 4, Oct.-Dec. 1993, pp. 439-517. Shuster, M. D., "A Survey of Attitude Representations," Journal of the Astronautical Sciences,Vol. 41, No. 4, Oct.-Dec. 1993, pp. 439-517. Nebelecky, C. K., Crassidis, J. L., Fosbury, A. M., and Cheng, Y., “Efficient Covariance Intersection of Attitude Estimates Using a Local-Error Representation”, Journal of Guidance, Control, and Dynamics, Vol. 35, No. 2, Mar.-Apr. 2012, pp 692 –696. Nebelecky, C. K., Crassidis, J. L., Banas, W. D., Cheng, Y., and Fosbury, A. M., “Decentralized Relative Attitude Estimation for Three-Spacecraft Formation Flying Applications”, AIAA Guidance, Navigation and Control Conference, AIAA Paper 2009-6313, Chicago, IL, Aug. 2009.